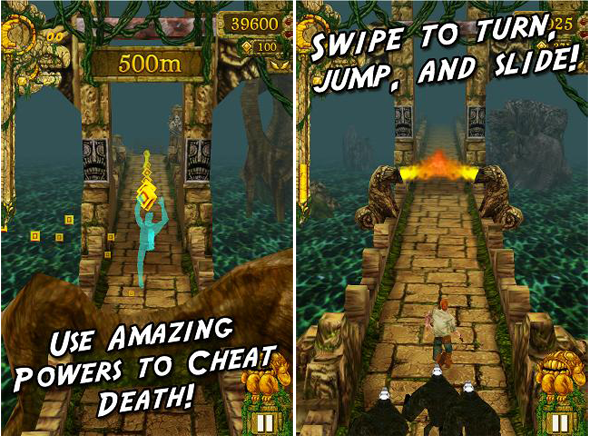 Official Temple Run Game Runs And Slides Onto Android – Download Now! No longer shall Android users have to suffer the indignity of downloading Temple Run from the Google Play Store only to find out that it is a cheaply made imitation from less than ethical developers trying to make a quick buck off the good name that Imangi Studios have built up. The Temple Run game has built up a huge reputation, thanks to the many thousands of downloads it has received on the iOS App Store and has quickly gained a cult following who can’t put the game down. Temple Run is one of those immediately addictive games that both infuriates and excites you, after all, what could be more adrenaline fuelled than running along the walls of a ruined temple whilst being chased by rather scary looking Evil Demon Monkeys? The Temple Run game is one of reflexes, where players need to keep their cool in order to navigate around tight corners, jump over flaming barriers and slide elegantly under archways, all while collecting as many gold coins as possible on the way. Phew, I’m tired just thinking about it. Imangi Studios have officially brought their smash hit game to the Google Play Store for Android devices featuring the same smooth gameplay as we have come to expect from the iOS offering. Temple Run for Android is effectively a clone of the game offering the same graphics and setting as we have gotten used to. But as the old saying goes “if it isn’t broke, don’t fix it”. Players are invited to buckle themselves in and help their character escape the clutches of the Evil Demon Monkeys for as long as possible by swiping on the device’s screen to turn corners and evade obstacles. The aim of the game is to collect as many gold coins as possible and rack up those points by running around the temple for as long as possible. The game is available as a free of charge download and contains no in-game advertisements, falling under the ‘freemium’ model, meaning that players can make in-app purchases in order to buy packs of gold coins which in turn allow new characters and power ups to be purchased, improving the overall gameplay. For those who are happy to plod along, collecting coins through the use of in-game skills, then this is one of the best free games available and will keep you entertained for hours as you attempt to beat your friend’s high scores. What are you waiting for? Join over 45 million players right now, but whatever you do, don’t let those Demon Monkeys catch you. Download Temple Run for Android [Google Play Link].